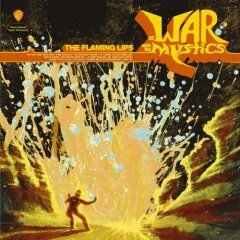 The Flaming Lips may finally achieve mainstream success with “At War With the Mystics,” their most accessible and radio-friendly release yet. While it’s full of funky sounds and quirky production, the CD also includes some of the band’s strongest songs. The Oklahoma natives, who had a modest college radio hit in the early 1990s called “She Don’t Use Jelly,” have been critically acclaimed for years. In 2003 — the same year they were both the opening act and the backing band for Beck — they won a Grammy for best rock instrumental performance. But “At War With the Mystics” should win them legions of new fans. The band calls itself “psychedelic alternative rock” and that’s not far off. The Flaming Lips are poppy, trippy, fun and unfailingly original. — Kim Curtis from The Associated Press wrote most of this review.